Hello ... Hello ... my old friends ... It's great to see you once again! Legendary Los Angeles based label Omnivore Recordings released news of an exciting new Pugwash compilation yesterday [30th July 2014] and also confirmed that the acclaimed Irish quartet would soon be embarking on their maiden US tour later this year via this You Tube video. 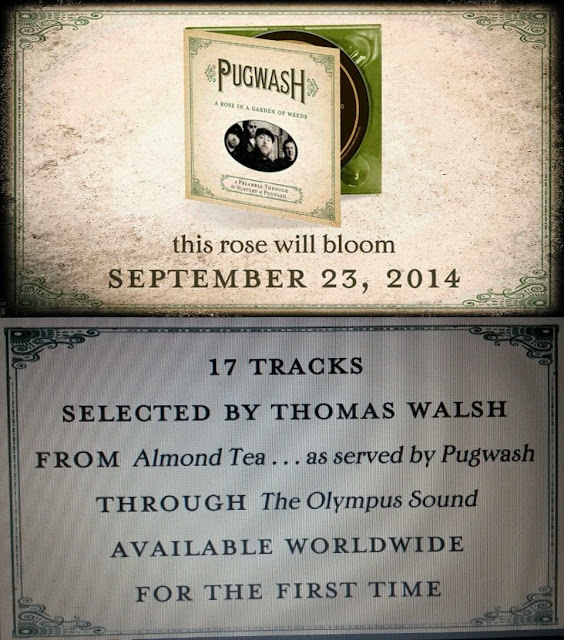 "A Rose In A Garden Of Weeds: A Preamble Through The History Of Pugwash" has been pencilled in for release on Tuesday 23rd September 2014 and will include seventeen  tracks personally chosen by heavily influenced ELO + Jeff Lynne founding member Thomas Walsh from their "Almond Tea" debut all the way through to latest studio album "The Olympus Sound". ELO Beatles Forever [ELOBF] recommends "A Rose In A Garden Of Weeds" by Pugwash to those enlightened folks who enjoy the music of ELO, Jeff Lynne, Roy Wood, The Move, The Idle Race, 'Brum Beat', The Beatles and related artistes.